Lakeside Homes is not represented by any real estate broker on any transaction. All of the Lakeside Homes’ houses will be built and sold using only Lakeside Homes employees. The majority of our homes are custom, “to be built” homes, built to our clients’ specifications. However, occasionally Lakeside Homes will build a house that is not pre-sold. These houses are referred to as “Spec Houses” and they are typically listed in the MLS during the construction phase with the intent to sell and close on the house post completion. Spec Houses get listed in the MLS with a 3% commission offered to any selling broker that brings Lakeside Homes a qualified buyer. The 3% commission will be based on the final sales price of the house, must be documented in a sales contract, and will only be paid at settlement. If for any reason settlement does not occur, there will be no commission. As stated, the majority of Lakeside Homes’ houses are custom “to be built” homes. Although the majority of our clients typically find us on their own, we occasionally build homes for clients that are referred to us or brought to us by a broker and we welcome those opportunities. In these cases, it must be documented up front that a given client is being represented by a broker on our sign-in sheet located in the model or by way of other acceptable documentation to Lakeside Homes. 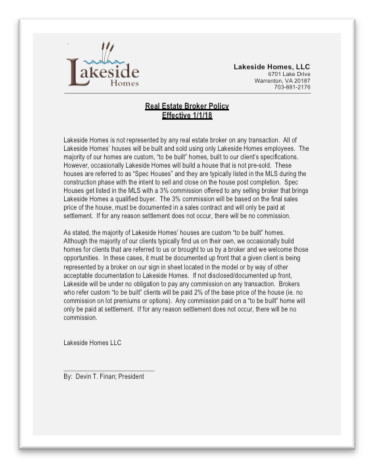 If not disclosed/documented up front, Lakeside will be under no obligation to pay any commission on any transaction. Brokers who refer custom “to be built” clients will be paid 2% of the base price of the house (i.e., no commission on lot premiums or options). Any commission paid on a “to be built” home will only be paid at settlement. If for any reason settlement does not occur, there will be no commission.